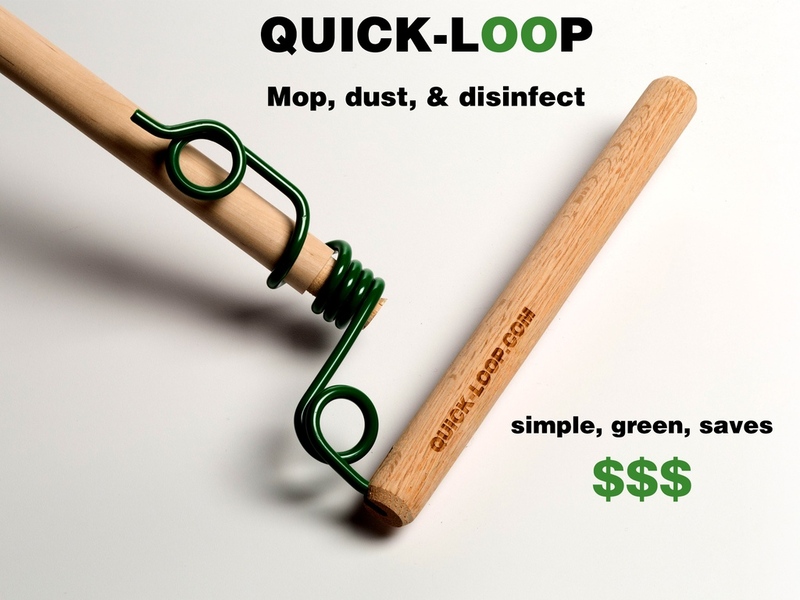 The patented Quick-Loop is a sustainable alternative to disposable deck mops or Swiffers. It uses terry cloth, rags, or microfiber cloth to mop or dust. Works well on hardwood or tile floors, around tight spaces near furniture, and even for hard to reach overhead surfaces. Inspired by the simple mops that Cuban home makers use but designed with modern technology to be more functional. 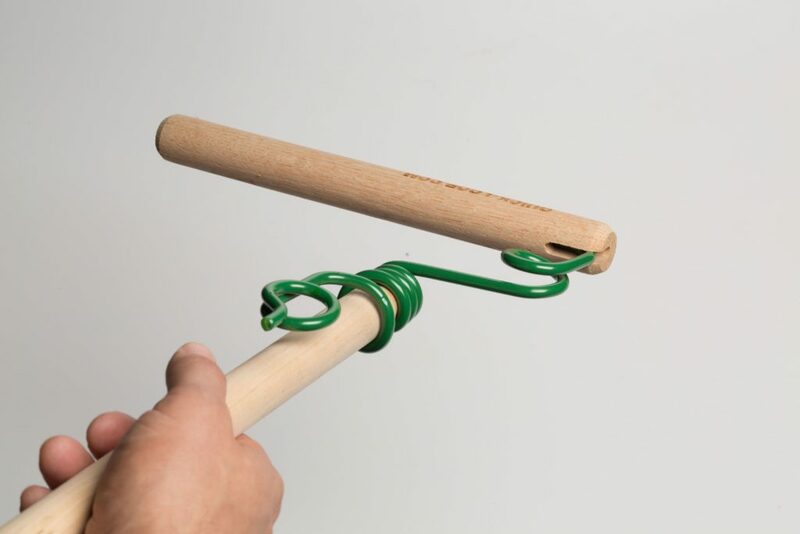 The Quick-Loop is made from oak and coiled steel. It’s a buy it for life tool that’s not only an easier way to clean, it’s better for the environment. The QUICK-LOOP is a different kind of mop. It’s a simple fabric holder. You choose what you want to clean with and can reuse it countless times. Made from oak and steel it can do what other mops can do, and much more. It takes one second to replace the fabric with a fresh clean cloth. This is a much more efficient way to clean a floor. The cloth tucks into the open loop. 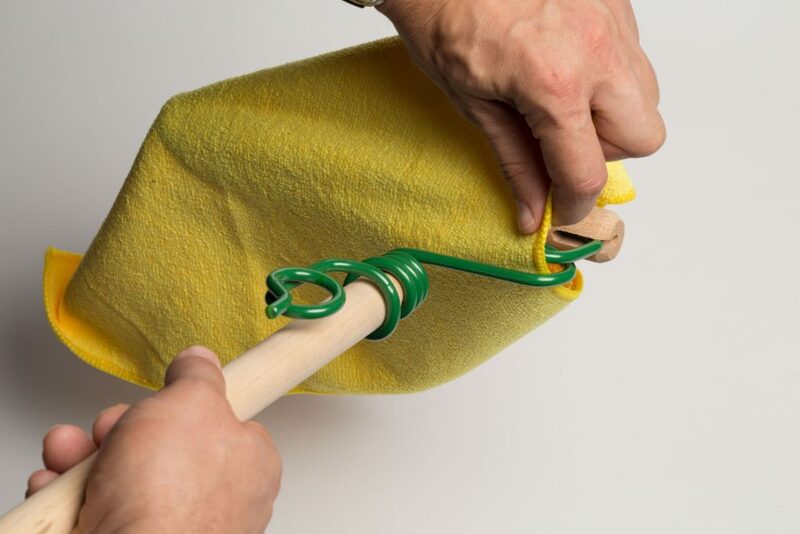 The loop holds the cloth for dry dusting or wet mopping. Pull the fabric into the loop and drape it over the dowel. You choose the fabric and the cleaner. Microfiber for dusting, terry cloth for scrubbing. Wet or dry. Hold the handle in one hand and pull the fabric through the loop with the other hand. 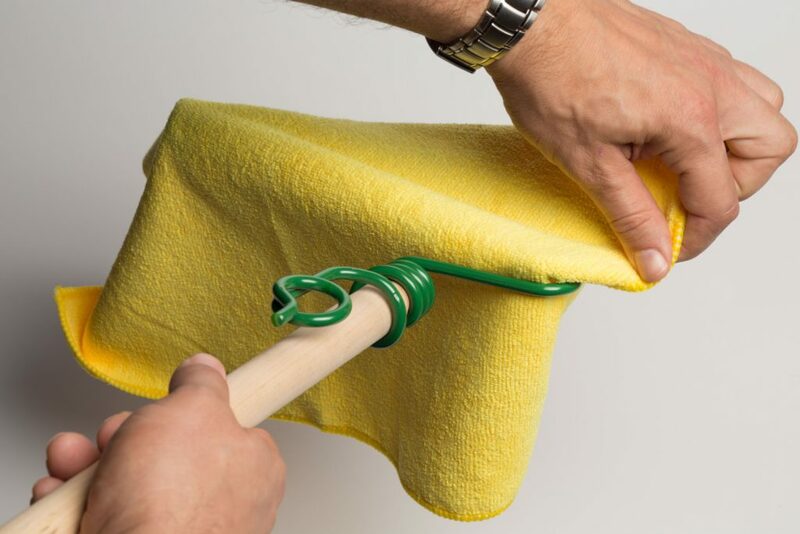 The QUICK-LOOP with a microfiber cloth is a powerful duster. But not just for floors. The L shape is great for dusting overhead or behind table legs. The patent pending shape is perfect for fan blades. The Quick-Loop head fits standard extension poles to clean high overhead areas. The QUICK-LOOP is best thought of as the best kind of combination of a deckmop and a flat mop. Like a deckmop it can focus the power of the scrubbing action into a small area. With the oak dowel I can really scrub hard to clean gunk on the tile, but the spring designed into the steel will keep it from scrubbing too hard and damaging a surface like hardwood. Scrubbing and wet mopping is where the Quick-Loop really shines. For best results use a terry cloth towel dipped in a bucket of your favorite cleaner. The solid oak dowel focuses the scrubbing to get off the gunk. The built in spring allows you to put just the right force on the surface be it hardwood, ceramic tile, or vinyl flooring. I like to keep the soapy water clean by rinsing a dirty cloth in the sink first. 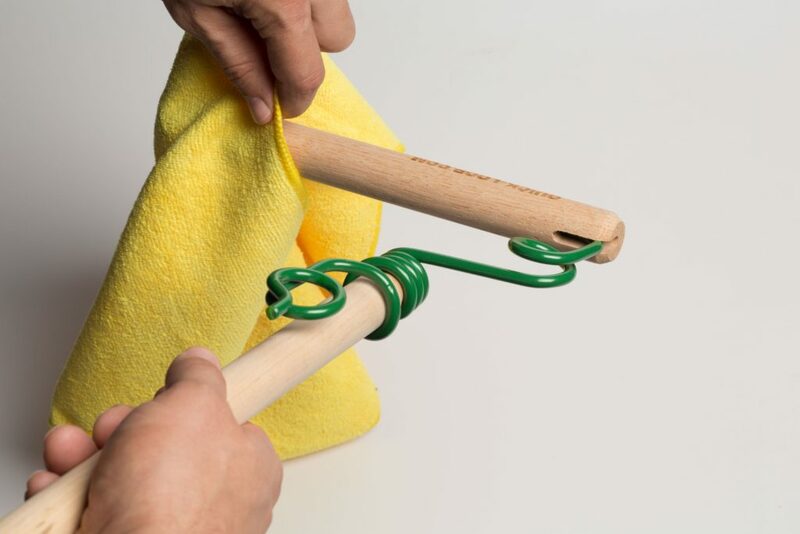 With a quick change after wet mopping the Quick-Loop can do double duty as a surface dryer with a fresh towel or chamois. Using your own cloth saves a lot of money over repeatedly buying deck mops, replacement heads for sponge mops, or packs of refills for flat mops. It is estimated that the quick-loop mop will save you an average of $144 per year! The combination of a high tech formed steel spring and the low tech red oak dowel create something totally unique. This cleaner works better, easier, faster, and more economically. It saves money and reduces waste. Order today and start now. Mops are in stock. 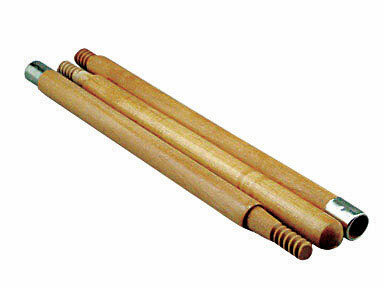 Order now and receive a free 3 piece wood acme threaded extension handle manufactured by Shur-Line. This durable handle is designed for contractors and built for commercial use. It assembles to a 40″ length. The old saying is that to get something clean you have to get something else dirty. That may be true, but you don’t have to make more landfill by buying endless disposable deck mops that mold after even one use or throw your money away on disposable synthetic cloths. There is a better way. Order a Quick-Loop, stop making landfill with disposables, and never buy a refill again. Steel and unfinished American oak. No moving parts to wear, no replacement sponges or sheets to buy. The loop traps the cloth and holds it. In stock. Ships US Priority Mail. Order your Quick Loop today!